This recipe is from Nick Malgieri’s Modern Baker Cookbook, a staple in our house. 1. Prepare the dough. Combine 1 1/4 cups flour, 3 tablespoons granulated sugar, salt and 1 teaspoon baking powder in the bowl of a food processor fitted with the metal blade. Pulse several times to mix. Add 5 tablespoons butter; pulse until the butter is mixed finely into the dry ingredients. Add egg and 1 teaspoon water; pulse repeatedly until the dough forms a ball. If it resists, add another teaspoon of water. 2. Invert the dough onto a floured surface and carefully remove the blade. Press the dough into a disk and wrap in plastic. Chill the dough until it is firm. 3. Place the cold dough on a floured surface. Gently knead the dough until it is malleable and clay-like. Press the dough back into a disk and roll it on a floured surface. Flouring the dough, roll into a circle about 14 inches in diameter. 4. Fold the dough into quarters and place it in a 9-inch glass pie pan. Unfold the dough. Trim away all but 1/2-inch of the excess dough at the rim of the pan, then fold the excess dough under so that it is even with the rim of the pan. Press down with a floured fork or flute the edge. 6. Prepare the crumble topping. Combine 1 1/4 cups flour, 1 teaspoon baking powder and cinnamon in a bowl; stir to mix well. Stir brown sugar into melted butter, then scrape the mixture into the bowl of flour. Use a rubber spatula to fold in the butter so that all the flour is evenly moistened. 7. Prepare the filling. 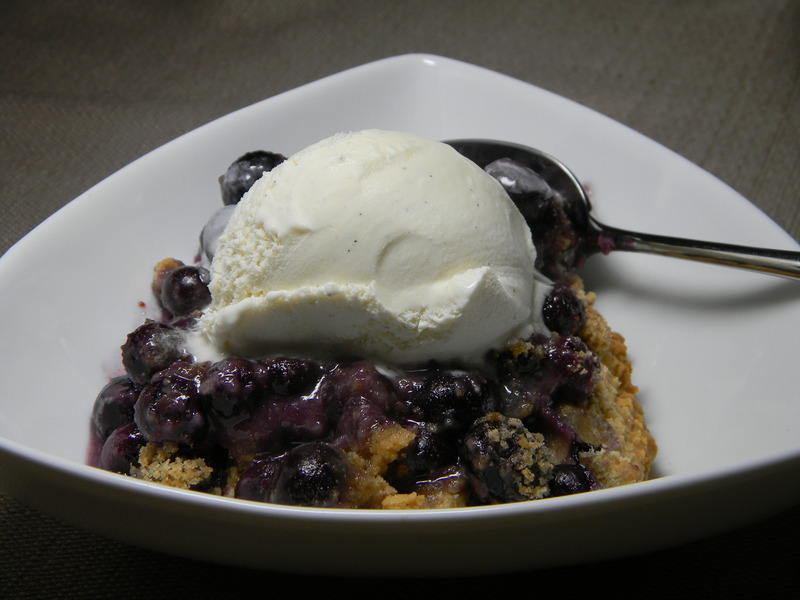 Put 1 cup blueberries and 3/4 cup granulated sugar in a medium saucepan. Cook over low heat, stirring often to bruise the berries so that they release their juices, until the berry mixture is boiling. 8. Meanwhile, whisk cornstarch and 2 tablespoons water together in a small bowl. Stir about 1/2 cup of the blueberry juices into the cornstarch mixture, then pour the cornstarch mixture into the boiling berry juices, stirring vigorously with a wooden spoon or heat-proof spatula. Cook, stirring constantly, until the juices thicken, return to a boil, and become clear. 9. Put the remaining berries in a large bowl. Add nutmeg. Use a large rubber spatula to fold in the thickened juices. Fold in the butter. Scrape the filling into the prepared pie crust. 10. 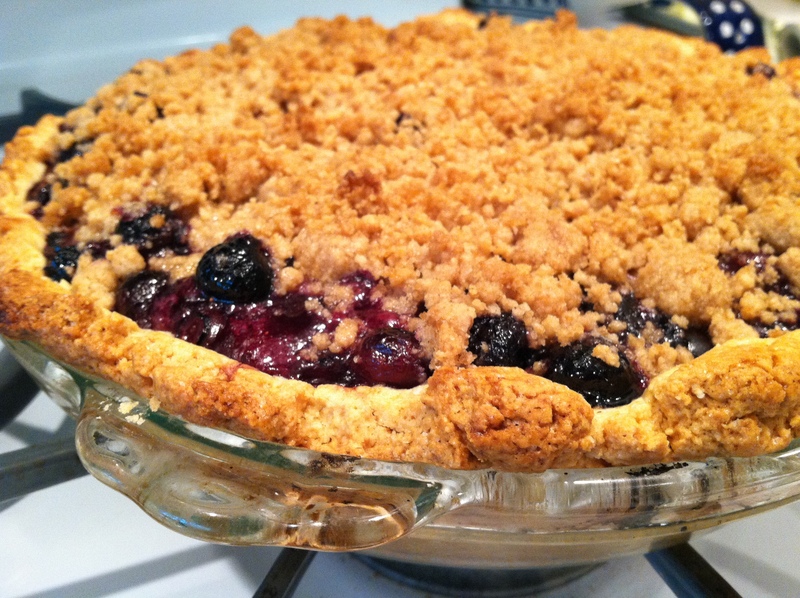 Use your fingertips to break the crumble mixture into 1/4- to 1/2-inch crumbs. Evenly scatter the crumbs over the filling. 11. Bake the pie until the crust and crumbs are well colored and baked through and the filling is gently simmering, about 40 minutes. 12. Cool the pie completely on a rack. Serve it at room temperature.